Choosing and financing your next vehicle can be a stressful process, but it doesn’t have to be. Thanks to the rotating Toyota specials at our dealership, you can find a Toyota Camry or Toyota Corolla for a price that won’t over-stretch your budget. 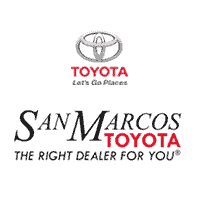 After you’ve taken a look at our new vehicle specials online, it’s time to visit San Marcos Toyota in San Marcos for a test drive. And if you have any questions along the way about our exclusive offers or new vehicle inventory, please feel free to reach out to our team at any time. Our team is here to walk you through the car-buying process and find the new Toyota that’s perfect for you. *Picture may not represent actual vehicle. Price varies based on Trim Levels and Options. See Dealer for in-stock inventory & actual selling price. All prices plus tax, title & license with approved credit. MSRP includes delivery, processing, and handling fees. Dealer doc fee $149.00 not included in price. Prices may be different outside of each advertised period and do not necessarily reflect cash price at any other time.